Lomuarredi supports Simon Yates at the Giro d’Italia 2018!!! 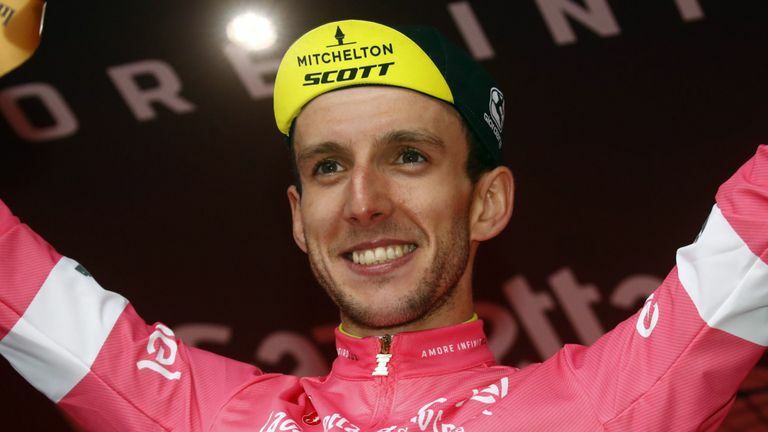 After David Millar, Bradley Wiggins, Mark Cavendish, Simon Yates is the fourth Englishman in the history of the Giro d’Italia to wear the pink jersey. Simon Yates is a British road cyclist and pistard who runs for the Mitchelton-Scott team. On the track he won the world title of the points race in 2013; on the road, where he has been a professional since 2014, he won a stage at the Vuelta a España 2016, a stage at the Giro d’Italia 2018 and the youth ranking at the Tour de France 2017. The captain of the Australian team Mitchelton Scott proved to be unbeatable on the climb, first leaving victory to his teammate Esteban Chavez on the stage of Etna and then winning the stage at Campo Imperatore on the Gran Sasso. That’s why, very impressed by the incredible performance, personality and humble behaviour, Lomuarredi supports Simon Yates! Supported by a strong and close-knit team he has every chance to win this Giro d’Italia 2018. 2)Johan Esteban Chaves (MTS) at 32”. 3)Tom Dumoulin (SUN) at 38”. 6)Richard Carapaz (MOV) at 1’20”. 7)George Bennett (TLJ) at 1’33”. 8)Rohan Dennis (BMC) at 2’05”. 9)P. Bilbao Lopez De Armentia (AST) at 2’05”. 10)Michael Woods (EFD) at 2’25”. Chris Froome instead began the Giro 2018 in an unfortunate way, before the first stage in Israel he fell heavily and in the Gran Sasso stage he fell again, going uphill into crisis and finished in twenty-third position with a 1’07” gap from Yates. The arrival of the Gran Sasso entered the legend of cycling after the feat in 1999 of Marco Pantani who, with a starring number, won the stage by winning solo detachment, ripping the pink jersey to the French Jalabert. The Giro d’Italia that has been disputed for more than a century is the toughest stage race in the world and this year the climb of Mount Zoncolan will be the watershed for the final victory. Go Simon Lomuarredi is with you! !